My parents Mr. 7 Mrs. Jacinto Curaza were born and resided in Asturias, Cebu, Philippines. They immigrated to the United States in 1925, stopping over in Hawaii. They first arrived in San Pedro, California. They finally settled in Stockton, CA in 1925 where their first child, a son, Benjamin was born. In two years twin girls, Helen and Virginia in Delano, CA in 1927. In 1930, a daughter, Carol was born in Santa Maria and the remaining children born thereafter in the Santa Maria Valley. All together they raised eleven children. Amparo was born January 16, 1936 in Santa Maria, but the family was residing in Casmalia, Ca at this time. 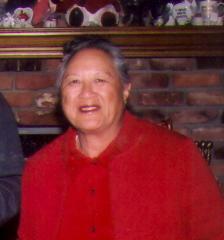 She was educated in Sisquoc and Santa Maria elementary schools and graduated in 1953 from Santa Maria High School. In June, 1953 she moved to Los Angeles, CA and worked for Pacific Telephone for eleven years. In 1964, she moved back to Santa Maria to work for ten years for the Columbia Records. In 1976, she worked for General Dynamics at Vandenberg Air Force Base. Retired after 17 years of service. Married Lewis Muca from South San Francisco in 1990. Still married and have no children. Reside in Santa Maria, CA. For 15 years she was a noon aide at Tunnell Elementary School retiring April 2007.